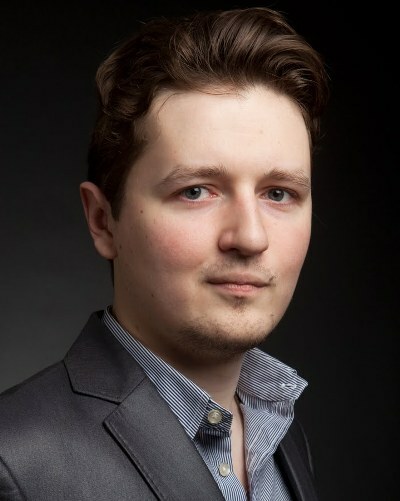 “The Property,” a new vest-pocket opera that burst onto the Chicago scene Feb. 25, is the sweet-spirited musical brainchild of a 28-year-old Minsk-born Polish composer Wlad Marhulets, who makes a living these days tooling music for films in L.A.
Marhulets came to the Lyric Opera by way of klezmer madness — not a disease, rather an exhilarating state of mind. It’s also the name of a legendary 1995 CD, by the New York-based clarinetist David Krakauer, filled with exuberant, darkly colored, sobbing and sliding dance-inspired melodies rooted in the Jewish secular music and Yiddish language of Eastern Europe. Krakauer still tours the world as a performer. Marhulets was about 16 when he first heard the album “Klezmer Madness” and decided thereupon to take up the clarinet and form a klezmer band of his own. Until then he had resisted his father’s wish that he become a musician although talent ran in the family; his older brother was already locally famous in music at the age of six. It was Cayenne Harris, the director of the Lyric Unlimited creative wing, who approached Marhulets with the idea of a klezmer opera based on a graphic novel. He said he was thrilled to accept. 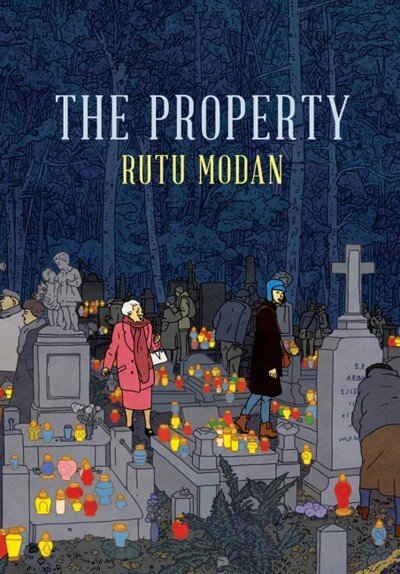 The beautifully illustrated work is an original by the Israeli artist Rutu Modan, about an old woman returning to Poland after decades, with her granddaughter in tow, on a mysterious quest. The result is a small-scale opera for six singers and six musicians that bespeaks a big-scale commitment to the Lyric’s nimble and ambitious Unlimited arm. The program received a $2 million infusion from the Mellon Foundation in 2012 that has helped to transform the company’s community outreach efforts by championing novel projects. No surprise that there’s a killer part for clarinet — Don Jacobs is on the reed, lending Old World flavor from the Maxwell Street Klezmer Band along with violinist Alex Koffman and double bassist Jim Cox. They know how to bend a note into a call from the heart. The ensemble is rounded out by piano, accordion and drums, all led by Michael Lewanski with evident ease, although he had to crane his neck from the ensemble’s position at the far right of the stage. Two of the singers in “The Property” are renowned for the powerful characters they create. Baritone James Maddalena brought Richard Nixon to life internationally in John Adams’s opera “Nixon in China” and now, at 60, has taken on his first role in Polish, as the elderly Roman Gorski. 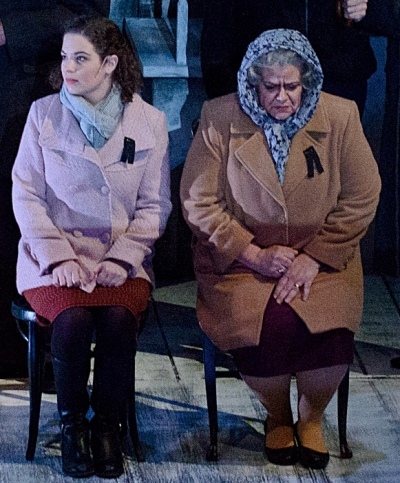 Mezzo-soprano Jill Grove, who is frequently at the Lyric, was most recently the witch Ježibaba in Dvořák’s “Rusalka.” Here she is the psychologically complex Jewish grandmother Regina Segal, from Chicago, who has recently lost her son, and whose distant past is Holocaust-related fallout in which Gorski played a central role. The two are endearingly jumpy in their tentative dance of recognition, as the story of a pair of long-ago lovers, torn apart by war and prejudice, unfolds. Marhulets’ music is bountifully melodic, colored by klezmer inflections most pronouncedly in the case of Regina, who is often awash in memory. 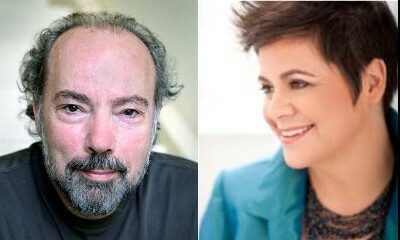 Director Eric Einhorn worked with librettist Stephanie Fleischmann to adapt the story, and although it waffles with a few too many talky twists and turns at first, their dramatic arc is sure and the last scene, which blooms in Marhulets-inspired radiance of honored memory and reconciliation, is best of all. 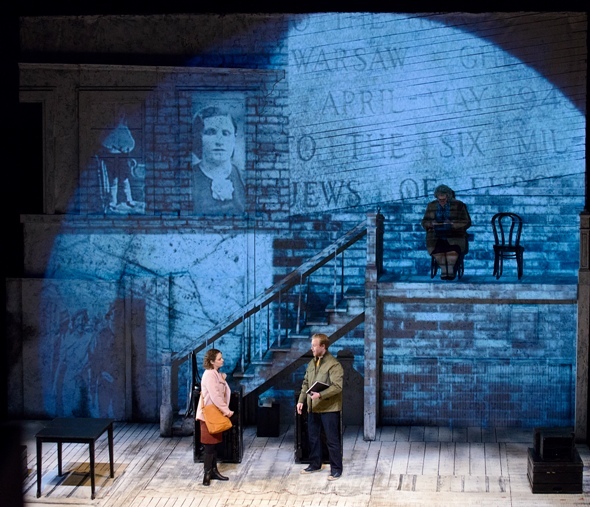 William Boles’ set design is of a single unit well-suited for touring — one seriously vintage wall that wears the grime of decades proudly and weathers Hillary Leben‘s collage projections well. One of her visual themes involved side by side projections as if from a stereopticon card, a subtle suggestion that separate pieces of a story must merge to achieve focus. A subplot involves the granddaughter Mica (soprano Anne Sloven), who gradually realizes that her grandmother’s ostensible mission to recover some lost property isn’t really what the trip is about. A love interest develops between Mica and local tour guide Thomasz (baritone Nathaniel Olson). 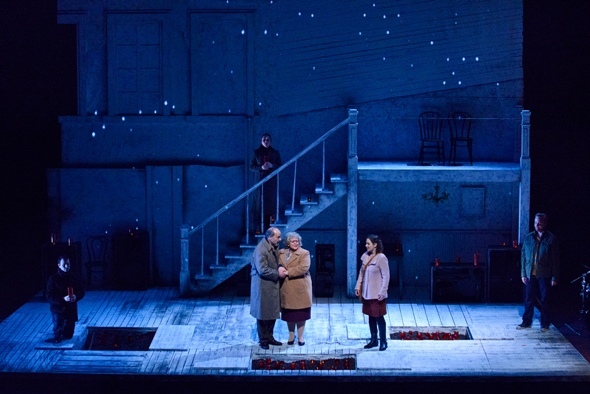 These were well-rehearsed, vibrant and nuanced performances, amply rounded out by bass-baritone Sam Handley and soprano Julianne Park, who filled various roles. The value of having some veterans in the mix, along with gifted newcomers, was evident. Einhorn was part of the production team for the Metropolitan Opera’s recent mounting of “The Death of Klinghoffer” and has worked on main-stage projects at the Lyric. Boles is active in Chicago’s theater scene. 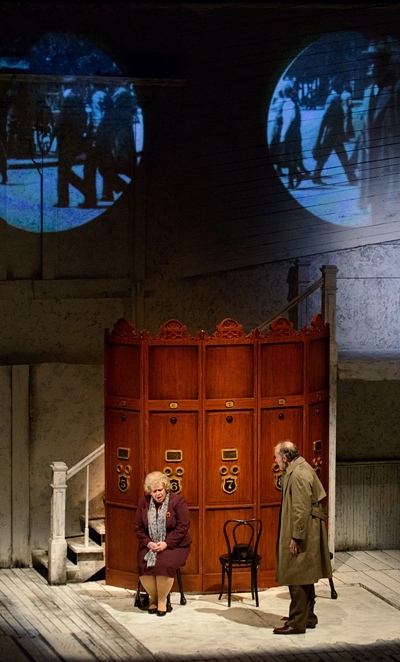 “The Property” world premiere is part of a variety of programs called Memory and Reckoning, designed to engage the community’s interest in the Chicago premiere of the enormous 1968 grand opera about the Holocaust currently on the Lyric stage – “The Passenger,” by Mieczysław Weinberg. More Lyric Unlimited projects are coming: the world premiere of a mariachi opera, “El Pasado Nunca Se Termina” (The Past is Never Finished) by José “Pepe” Martínez and Leonard Foglia, featuring the Mariachi Vargas de Tecalitlán, in March; and the world premiere of a children’s opera at the Lincoln Park Zoo, “Second Nature,” by Matthew Aucoin, in August. These projects may not be as grand in scale as the “Toscas” and “Tannhäusers” that command the Lyric’s main stage, but they are certainly exciting in prospect and ambitious in scope. One of Anthony Freud’s first comments when he became general director of the Lyric in 2011 was that opera companies in general had been inward-looking rather than outward-looking for too many years and that new projects, and new ways to engage the community, were essential. He appears to be making it happen.